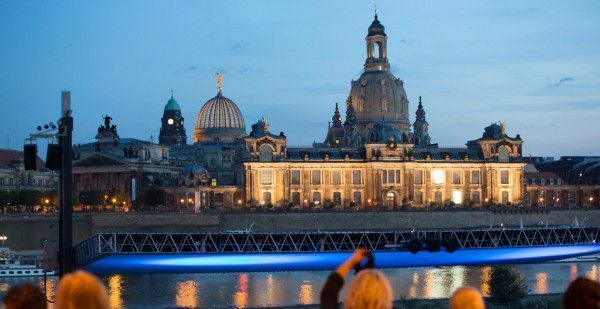 Held every year in Dresden, Germany, The Filmnächte am Elbufer (eng: Movie Nights at the banks of the river Elbe), a unique outdoor cinema experience, enchants guests from around the world with impressive high-tech stage shows in front of a picturesque backdrop. On warm summer nights, thousands of visitors flock to the event daily to watch the year’s most exciting blockbusters under the stars with their friends and family. The crowd is made up of residents & tourists alike, some of them having traveled far and wide just to be a part of the experience. No wonder why the organizers of the event accepts nothing less than making it an unforgettable evening for all of their guests. The Filmnächte am Elbufer‘s sheer popularity and city-wide presence shape guests’ extremely high expectations, putting an enormous amount of pressure on the organizers to deliver the excellence customers are looking for & live up to their unbeatable reputation. Before teaming up with Feedbackstr, Filmnächte am Elbufer‘s organizers, PAN GmbH, used pencil & paper surveys to measure their customer satisfaction – a pretty outdated method for such an innovative event. Feedbackstr was faced with the challenge of delivering a solution which was just as high-tech as the event is itself and resulted in a much higher response rate. The surveying method was to be made faster and easier to collect as well as evaluate valuable guest feedback. In fact, the organizers required the possibility to analyze customer satisfaction in real time, enabling them to make immediate improvements during the event and turn possibly negative experiences into great ones. To do so, they required specific customer feedback about various aspects of their business, such as snack options or staff friendliness. Feedbackstr crafted a custom-made solution for the unique event which took all of its customer’s specific requirements into account. To raise the response rate and ensure the quick collection of guest feedback, a group of trained promoters was hired to come to the event every night & pass out tablets to guests, therefore enabling movie-goers to directly & digitally submit their feedback. In addition, posters, flyers, & table displays were also placed at multiple touch-points on the grounds, generating even more responses for the customer’s customer satisfaction measurement & enabling guests to also submit their feedback on site or from home. By involving Filmnächte guests in operational improvements, the movie fans were given the opportunity to actively change the face of the large-scale event, subsequently improving customer satisfaction. Through Feedbackstr’s visitor survey, PAN GmbH now receives an incredible 4,000 responses yearly. Interesting opinions regarding snack choices, service quality, and staff friendliness enabled the recognition of room for improvement. With Feedbackstr’s real time evaluation technology, the organizers were also able to make immediate changes and improvements based on guest feedback. In addition, various guest ideas and suggestions are considered during the planning phase of each year’s Filmnächte am Elbufer event. The digital satisfaction measurement has reduced reaction times, generated more responses than ever before, eliminated the painstaking manual evaluation of results, and tangibly improved customer satisfaction. The use of Feedbackstr has proven to be so beneficial for the organizers that their collaboration with Feedbackstr has been going strong since 2013.